Weighted blankets are designed to help people manage problems related to anxiety, insomnia, depression and autism. These heavy blankets create gentle pressure on the body that many say feels like a comforting hug. Getting under a blanket filled with chains, weighted pellets, or balls can help reduce many anxiety-related symptoms and help you sleep better. Many people start using weighted blankets to help avoid or reduce their reliance on medication for various mental health-related conditions. Even though research is limited, there are some scientific studies showing the benefits of weighted blankets. There is also plenty of anecdotal evidence on the effectiveness of anxiety blankets, autism blankets, and heavy blankets for sleeping. In this article, you will learn about scientific evidence highlighting weighted blanket benefits. You will also learn about what type of anti-anxiety heavy blanket may be best for you. At the end of the article you will learn about the cons of these blankets and why weighted blanket may not be for everyone. Weighted blankets are specially-designed blankets that use weighted materials to make them heavy. Weighted blankets look just like ordinary blankets and come in various sizes and colors. 15 lb. weighted blankets and 20 lb. weighted blankets are the most popular types of heavy blankets. Therapeutic weighted blankets use glass beads, ceramic pellets, and even chains for weight. These heavy blankets create all-over body pressure, and the weights in the blankets are designed to be virtually undetectable. Manufacturers of heavy blankets say that the gentle pressure on the body creates a comforting feeling of being hugged. For example, one of the most popular therapeutic weighted blankets is the Gravity Blanket. It is claimed that the hugging sensation has a positive effect on the mind and helps to reduce health conditions related to anxiety and mental health. Can weighted blankets provide the comforting, calming, reassuring, and safe feeling you need to help sleep better and reduce anxiety? The principal in which these blankets work is mimicking the effects of hugging. There is some scientific evidence showing that hugging can be therapeutic. So, there is some indirect evidence that the weighted blankets for adults and children can help deal with stress better. However later on you will find direct studies about the weighted blanket itself. In fact, people who regularly use a weighted blanket say that they get to sleep faster, wake up less often during the night, and enjoy better quality sleep. Many therapists also recommend weighted blankets for autism as it can help autistic children feel safe and secure and less stressed out. Occupational therapists also use weighted blanket therapy for disorders such as attention deficit hyperactivity disorder (ADHD), sensory processing disorders, and anxiety. Is there scientific research that backs up many of the claimed benefits of weighted blankets? Let’s look in more detail at some of the reasons for using a sensory weighted blanket. Using a heavy blanket for sleeping can help to improve your quality of sleep and feel more rested in the morning. There is some evidence that getting to sleep under a weighted blanket could help you fall asleep faster. 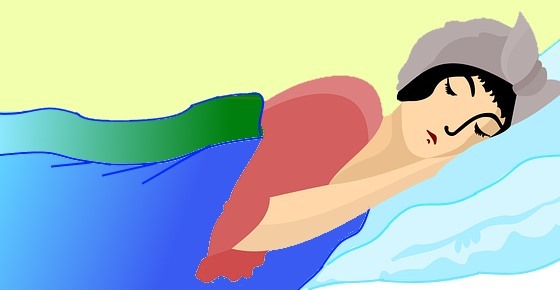 In fact, heavy blankets for sleeping can benefit people who suffer from insomnia due to anxiety-related problems. To help fall asleep faster, you can learn about which are the best foods to eat before bedtime. You can also try using some essential oils such as lavender to help fall asleep faster. Using a weighted blanket for anxiety can help to greatly improve your quality of life and feel less stressed. Anxiety can affect the body in many different ways causing insomnia, high blood pressure, digestive upset, and depression. An anxiety blanket can also help address many of the issues related to anxiety. Apart from sleeping with a weighted blanket for anxiety, you can find out about more ways to treat anxiety naturally. You may also help lower anxiety by adding some delicious foods that help to boost your mood to your diet. The hugging effect of a weighted blanket can also help children who show symptoms of attention deficit disorders. ADHD can cause children and adults to become extremely restless, easily distracted, hypersensitive, or have difficulty concentrating. You can find out how vetiver essential oil can help manage symptoms of ADHD. You can also use ingredients like omega-3 fatty acids as a complementary therapy to using weighted blankets for kids with ADHD. Using sensory blankets for autism is one of the most common reasons why people buy weighted blankets. Many occupational therapists recommend using weighted blankets for an autistic child. But is there any evidence that these therapy autism blankets actually work? Using a therapeutic weighted blanket can also help manage symptoms of sensory dysfunction conditions. What Size of Blanket is Right for You? If you think that a therapeutic weighted blanket for anxiety could help improve your quality of life, then which is the best weighted blanket for you? The theory behind using weighted blankets is that the effect of deep pressure helps to elicit a feeling of comfort and safety. Weighted blankets are sold in sizes and weights suitable for children and for adults. For example, if you weight around 120 lb., a 12 lb. anxiety blanket should provide enough relief. If you weigh 150 lb., then you should buy a heavy 15 lb. blanket for its therapeutic benefit. You can also buy smaller weighted blankets for children if they have problems sleeping or have ASD or ADHD. Some therapy blankets for children weigh 5 lb. or 7 lb. When choosing the best type of weighted blanket for adults or children, it is important to buy one of a good quality. For example, the Gravity Blanket (like this one) is made from extra soft micro-fiber material that won’t irritate even sensitive skin. Also, it’s important that the weighted material in the blanket doesn’t move around. There is much anecdotal and some scientific backing on using a weighted blanket for coping with many anxiety-related mental health disorders. However, you may find that using a heavy blanket for sleeping isn’t for you. What are some of the drawbacks of using a therapeutic blanket for anxiety? Here are a few factors to consider. Weighted blankets are expensive. First, there is the cost to consider. The best and most popular type is the Gravity Blanket (like this one) which costs around $250. However, there are some cheaper sensory weighted blankets on the market (such as this one and this one). Size and weight. Weighted blankets are much bulkier than your traditional duvet cover and may take up a lot of storage space. Also, delivery costs can be expensive for 20 lb. or 30 lb. weighted blankets. Other health concerns. Weighted blankets may not be appropriate if you have other health concerns. Although sleeping under a heavy weighted blanket can help ease stress and anxiety, they may restrict circulation, breathing easily, temperature regulation or make it difficult to move. Sleeping temperature. You should also buy a good-quality weighted blanket that is made with breathable soft fibers to prevent you from getting too hot. Not always suitable for children. If you have a child with ASD or ADHD, it is best to speak to your healthcare provider before buying a weighted autism blanket. Manufacturers of weighted blanket also say that if you are concerned with the ability of someone to remove the blanket on their own without assistance, it is not recommended for them to use the blanket without supervision. If you are using a weighted blanket for sleep or anxiety, you may find that some natural remedies can increase its effectiveness. Even if you don’t use a heavy blanket for getting to sleep, these natural home remedies can help lower your stress levels. Inhaling lavender oil straight from the bottle or putting a few drops in your bedroom diffuser can help you sleep better. Other essential oils that can help treat anxiety and improve your sleep patterns include bergamot essential oil, jasmine essential oil, and geranium oil. Lavender is also one of the best plants to put in your bedroom to help you sleep better. There are certain foods that help you sleep better because they affect certain hormones in the brain that help induce sleep. These types of foods are good to eat before bed because they help regulate sleep, relax your mind, and can result in a calmer, more enjoyable night’s rest. You can find more information in my article about proven foods to help you sleep (Science Based). There is actually some evidence that warm milk can help children and adults fall asleep quicker. You can find out about another delicious drink to have before bedtime to help you sleep better. You can use a special breathing technique to help fall asleep faster. This is a method of inhaling and exhaling that has been proven to help relax your body, slow your heart rate, and help you feel calmer before falling asleep. To learn more, please read my article on the best breathing techniques to fall asleep in under 60 seconds.